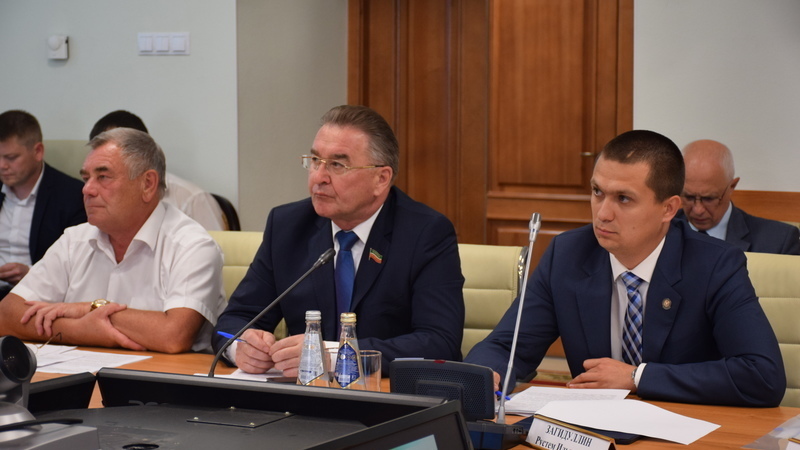 On July 5, 2018, Minister of Justice of the Republic of Tatarstan R.I. Zagidullin took part in the meeting of the round table on topical issues of the activity of local self-government bodies chaired the chairmanship of the First Deputy Prime Minister of the Republic of Tatarstan R.K. Nigmatullin, held in the Association of the Council of Municipalities of the Republic of Tatarstan. The event was also attended by Deputy Head of the Office of the President of the Republic of Tatarstan - Head of the Territorial Administration I.M. Garipov, Chairman of the Association «Council of Municipalities of the Republic of Tatarstan» E.S. Gubaidullin, Chairman of the State Council of the Republic of Tatarstan Committee on State Construction and Local Self-Government A.G. Habibullin, heads of executive committees of all municipal districts, city districts of the Republic of Tatarstan, representatives of ministries and departments. During the meeting, the Minister delivered a report «On Amendments to the Law of the Republic of Tatarstan «On Urban Development in the Republic of Tatarstan». The round table also examined issues of licensing the use of subsoil for the purpose of extracting ground waters and the organization of zones for the sanitary protection of water sources in the municipal districts of the Republic of Tatarstan and on maintaining and putting in order the hydraulic engineering structures owned by the municipalities of the republic, costs for issuing a security declaration for the Hydraulic structure.